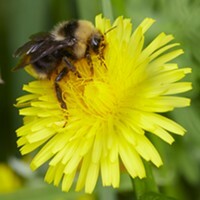 A bumble bee investigates a dandelion. 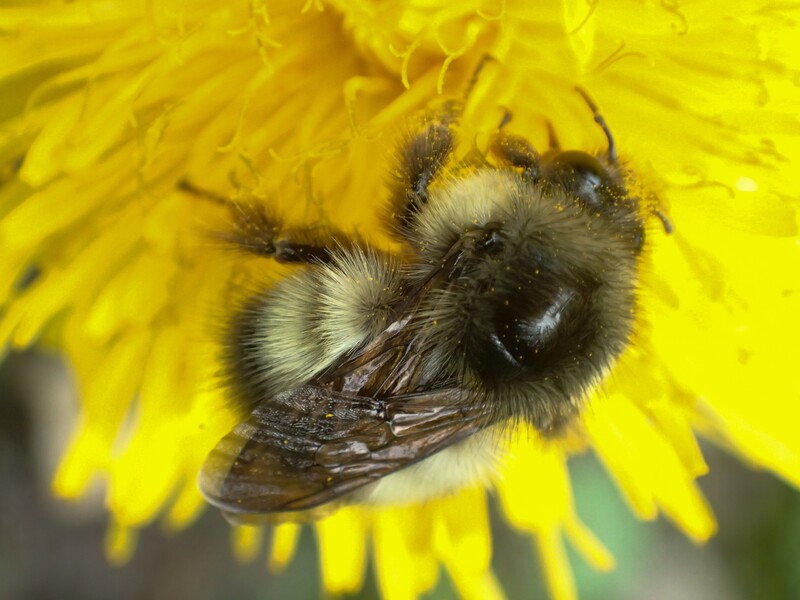 Yesterday while working outside, I noticed a large black and yellow bee diligently working its way around the periphery of one of the many dandelions in my yard. I paused and took a picture of it to report to Bumblebee Watch. 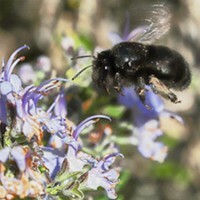 They are tracking various species of the genus Bombus, some of which are endangered. On their website there is a nifty opportunity to compare your photo to drawings designed to extenuate identification characteristics of the various North American species. 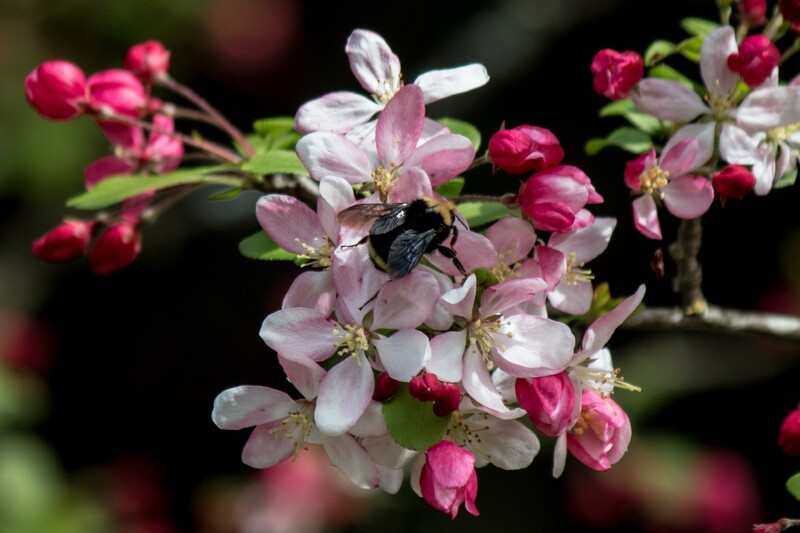 A crab apple blossom get a going over by a bumble bee. Around the world there is a growing industry of breeding bumblebees to provide an alternative to the commercial honey bee (Apis mellifera). Although they do not produce honey, they offer several advantages. Thanks to their largely dark coloration, fuzzy bodies and some unique anatomy, they can fly at cooler temperatures. 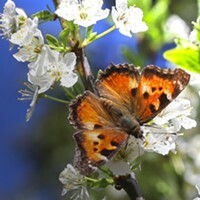 They are also more effective at pollinating some flowers including tomatoes by using sonication, or “buzz pollination, shaking pollen loose by vibrating their wing muscles. Their black and yellow coloration is almost universally recognized in nature as a warning to potential predators that they can sting. Finally, only the queens, and not their nests, over winter so they require less off-season care. 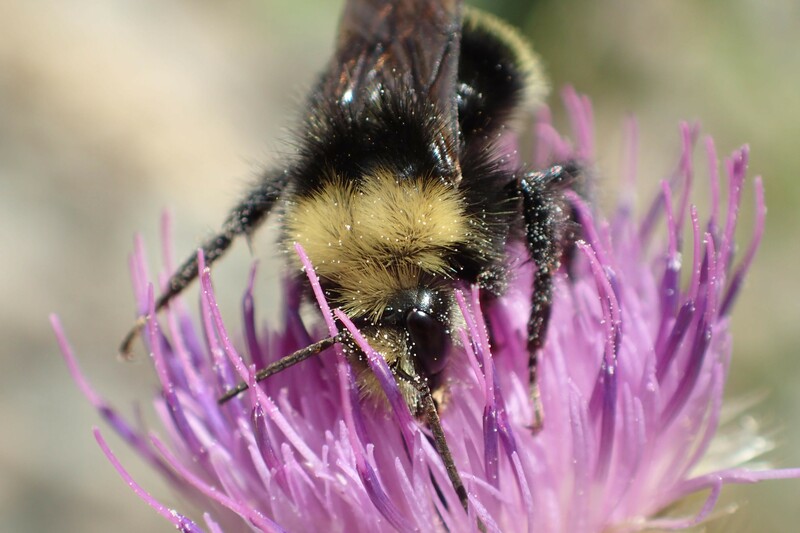 As CCD (Colony Collapse Disorder) decimates commercial bee populations bumblebees have been seen as a potential replacement, but recently there have been articles implicating our trafficking in their honeybee cousins as spreading diseases and parasites which can effect them as well. The fuzzy fellow on a thistle. On occasion I have noticed one flying around me at a dizzying pace and buzzing loudly. I suspect it may be warning me to stay away from its nest which is often in an abandoned rodent burrow or other hole in the ground. This warning behavior might just have been the inspiration for Rimsky-Korsakov's Flight of the Bumble Bee. There are hundreds of renditions online for every instrument you can imagine, whether it's David Herzhaf on diatonic harmonica, or Russia's National Orchestra it never fails to bring a smile.